Caramel Wings: Bettering Breakfast - A new series!! And what better way to start it than with Pancakes? and Mangoes? AND Chocolate? Bettering Breakfast - A new series!! And what better way to start it than with Pancakes? and Mangoes? AND Chocolate? Breakfast is my most favorite meal of the day. Most nights I go to sleep thinking what I would be having for breakfast the next day. I am so crazy about a good breakfast that I many times end up having breakfast for Lunch and sometimes for Dinner too. Not too proud of that but it's kind of an addiction. So one would be able to imagine how my reaction was when I saw a Re-tweet by Culinary Storm on my Twitter Timeline about 50 of the best breakfasts in the world, by Victoria Philpott. My reaction was somewhat like this. And then I thought, I HAD to do something about it. What if I try making some of these recipes? So I tweeted to Ms. Victoria Philpott and she loved the idea too! I then put up a status on my facebook page asking for people to tell me what their favorite breakfasts were. And I got a lot of variety there too, mostly Indian variety, which is awesome coz people around the world really don't know what are the types of breakfasts in India. Finally I decided to go ahead and do a feature on my blog, 50 breakfast dishes that I think would be great to try out in the kitchen, and what a great variety it would make! It was the most difficult thing to pick one recipe to start with, but for the first time I would like to thank my PMS that made me crave Mangoes and Pancakes and hence this recipe was born. Tangy Buttermilk Pancakes, with Diced velvety Mangoes and drizzled with Chocolate Sauce, topped with Ice Cream or Whipped Cream. What more could one ask for? 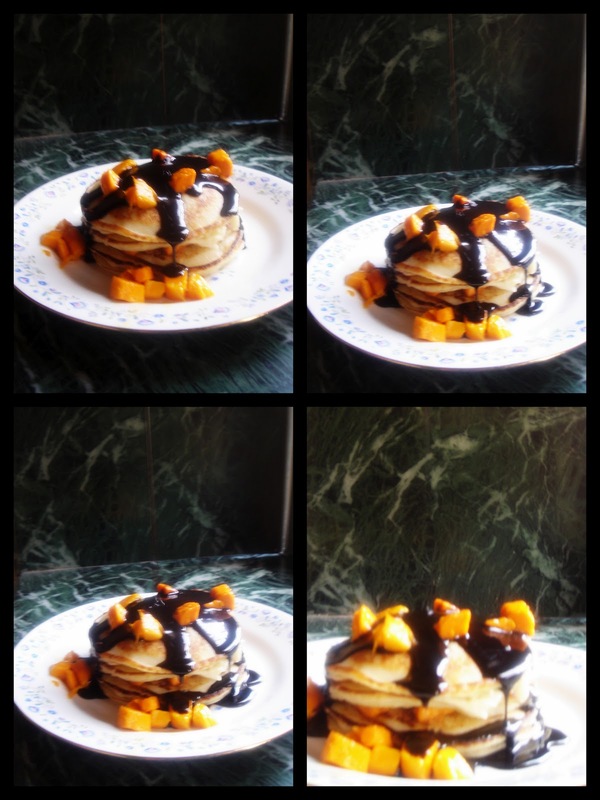 Tangy Buttermilk Pancakes with Chopped Mangoes and Chocolate Sauce. Peel the Mango. Cut into dices. Put in a bowl and refrigerate. In a small Saucepan, add the Sugar and Water. Heat this up until Sugar is dissolved. Add in Cocoa powder and mix, then add in the chocolate and mix till melted. Transfer to a container and let it cool. It will thicken as it cools. In a big bowl, sift together Flour, Sugar, Salt and Baking Powder. Set Aside. In another bowl whisk together Buttermilk, melted butter and the Egg until well mixed. Add the Buttermilk mixture to the Flour mixture and mix, don't overmix. You don't want all that air to escape to have fluffy pancakes. Heat up a pan on medium and add a little bit of butter/ghee. Pour in 1/4 cup of the mixture and let it cook till it has small bubbles on top, or up to 2 minutes. Flip it over and give it another minute to 90 seconds. Make two of these and then add half of the mango dices from the refrigerator. Then top it up with the remaining two pancakes. Put the remaining Mangoes on top and around the assembly. Top it with Vanilla Ice Cream or Whipped Cream!! This picture deserves to be put up. It was finished in record time! Really yummy! The chocolate sauce looks amazing. Thanks :) So glad you like it! You should have been my neighbour. What lovely breakfast!